The City Engineering Department will present their plan for the redo of Harding Avenue as they seek approval from the City Council. The public hearing on the 26th is the only time left for the public to officially react to the Engineer’s plan; this meeting will start at 7 PM. On March 27, starting at 4 PM the City Council will vote on items presented for a hearing on the previous day. Again, there is no official public input at the meeting on the 27th. For months the East Side Hill area and the Third Ward has been in dialogue with the Engineer’s office looking for ways to improve the efficiency and safety of that project. Our Steering Committee passed three resolutions as part of this process: 1. Okayed a designated left turn signal for eastbound traffic at the intersection of Harding Avenue and Margaret St, while not wanting to encourage cut-thru traffic on Margaret. 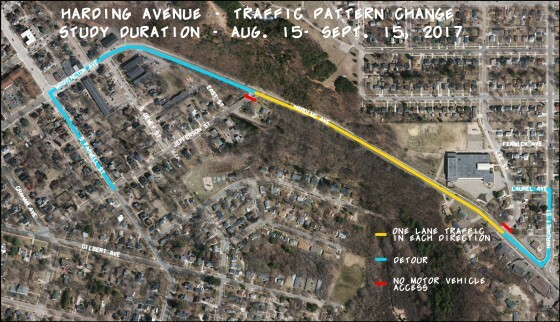 2.Urged closure of Lee Street at Harding Avenue to improve the safety at Flynn School. 3. Recommended 30 mph speed limit versus 35 mph on Harding Avenue to be acted on ASAP. In general there was support from EHNA for non-vehicular safety versus more convenience and speed for car traffic. On March 22 the city will post their agenda for the next Monday’s public hearing on multiple items, including our first look at the Engineer’s final plan. The hearing will begin at 7 PM on the 26th but we won’t know until the 22nd the order of business for that hearing. You can get the agenda on the 22nd on the City’s website. Our Association will use our own web site to give you more info based on reading that agenda. This surface redo of Harding Avenue won’t be up for change for at least 10 years so it is important to address safety issues now because we will have to live with them. There is concern about safety for pedestrians and bicyclists both on the north side of Harding Avenue which has had little protection from car traffic, and the crossing at Harding Avenue and Jefferson.